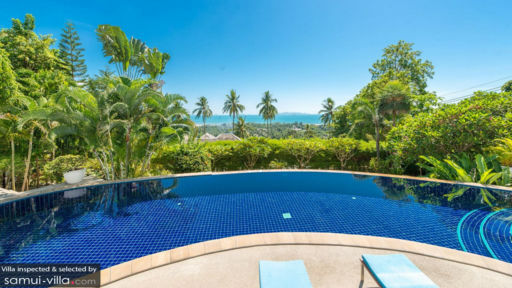 White Stone is a four-storeyed holiday villa accentuated by an infinity swimming pool, 20-metres in length and four distinct as well as lavish bedrooms. 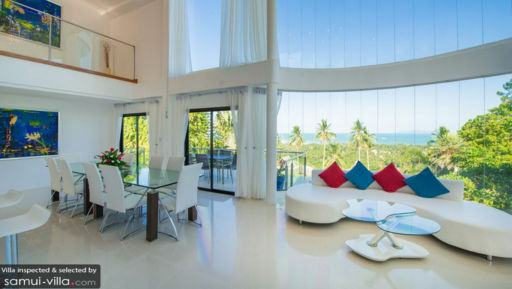 With two living areas to offer the utmost comfort to guests, this contemporary home near Nathon in Koh Samui is a perfect getaway for some fun-packed times with friends and family. Large glass windows ensure you get a mesmerizing view of the ocean whenever you look outside so you can make the most of these abundant surroundings. The primary feature of the four bedrooms at White Stone are the floor-to-ceiling glass walls that permit you to enjoy a breathtaking view right from the comfort of your bed. Three of the bedrooms are furnished with king-sized beds while one is furnished with two singles. For additional space, the villa offers two king-sized mattresses so they can accommodate a maximum of ten guests. En-suite bathrooms adjoin the bedrooms for a convenient stay as they are fitted with soaking Jacuzzis and/or showers. Flanked by a sun deck, the 20-metre swimming pool dazzles under the tropical sun and as you gaze out towards the ocean, you are sure to feel lightheaded from the abundance of nature that surround you. Lush and verdant foliage encircles the villa in a halo of fresh and crisp green that you can enjoy while lounging on the deck chairs found on the sun pavilion. Parasols keep you from the shade and you can easily take a nap or read a good book all the while relishing the fresh breeze that blows throughout the day! On the porch, there are rattan sofas and armchairs where you can take in the scenic beauty. Starting from the porch area, where you have a pool table for impromptu matches, rattan couches, and a bar, the upstairs living area is a sight to behold with its crisp and pristine white interiors, large glass windows that allow for abundant natural light and a dazzling view. There are comfortable sofas on the same floor alongside a ten-seater dining table that can accommodate all guests with ease. Leading out to the terrace, there is an alfresco dining option as well to enjoy a delicious meal in the heart of nature. Two statement chandeliers draped with crystals hang royally from the high ceiling of the living area. The kitchen is swanky and fully-equipped with modern amenities. As you ascend the steps, you will reach the main, more lavish living room at White Stone complete with white couches and sofas, a flat-screen TV with satellite cable, and surround sound. Shelves are lined with books, artefacts, and other interesting things. Fuchsia pink bean bags brighten the space and wooden flooring creates a warm ambiance in the living room. Enjoy an evening of wine and appetizers with loved ones as everyone gathers around the living room for a memorable time! The villa is fully-staffed and the services offered are quality five-star amenities with housekeeping, security, and upkeep all taken care of. A villa manager oversees the work of the other employees and will also help to make arrangements on your behalf for transportation etc. 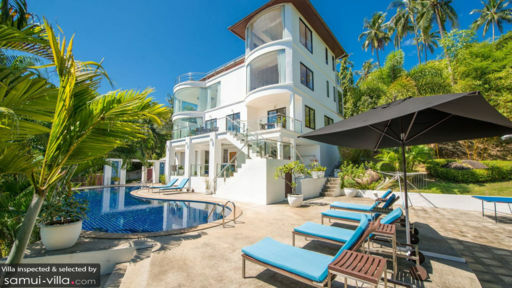 The villa is located near the city of Nathon as well as the beach so you although you have a quiet location all to yourself, you can even travel to the city centre where you have a horde of restaurants, bars, and cafes offering delicious treats including local Thai food!